Sodium is necessary to human life. We each need about 1.5 grams of sodium per day in order to maintain the electrolitic balance in the body and enable the human central nervous system to function. The body’s metabolism and the heart wouldn’t function without it. 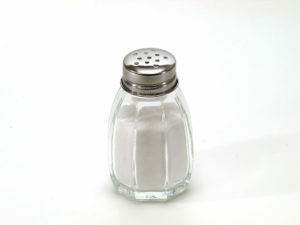 Crystalline sodium chloride (NaCl), or salt, is our primary source of sodium. So it’s not surprising that the processing of salt began very early in human existence. There is evidence of salt production, in what is now Romania, from 8,000 years ago, with a similar discovery in China belonging to the same period. This is the neolithic, when homo sapiens was still, in part, living in caves. Even then, we needed salt. All the early civilisations took salt from the sea or mined it, from deposits which were once even more ancient seas. The books of all the major religions reference salt – in the Old Testament, Lot’s wife was turned into a pillar of the stuff. 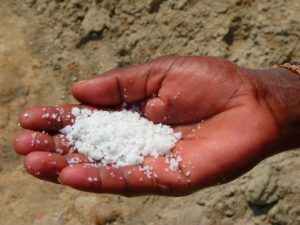 In the New Testament Matthew likens Christ’s followers to ‘the salt of the earth‘. The Prophet Mohammed cited salt as one of the four great god-given things. Hinduism, Jainism, Buddhism and Shintoism reverence salt as propitious and the ancient Egyptians, Greeks, Romans and Aztecs all used salt in rituals. Salt is found in folk and fairy-tale, e.g. chosen by the truthful daughter in the Lear-like tale of the King who asks his three daughters how much they love him. It is part of superstition, we throw salt over our shoulder to avert bad luck. Salt and salt pans form a distinctive landscape. At El Puerto Santa Maria in the Bay of Cadiz, only some of the old pans are still in use, production having moved to the Canaries and elsewhere in Spain. 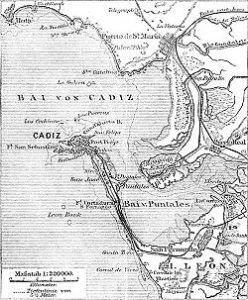 Yet the old and disused Roman salt evaporation ponds stretch out for miles across the muddy, watery half-landscape all around the Bay ( see Cadiz in the Rain ). They feature in a dramatic getaway in the third book of the Al Andalus series. More recently, I visited the salt pans at Gruissan, in the south of France. 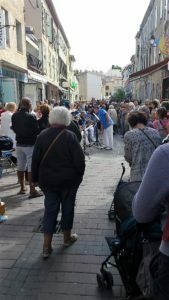 It was the Gruissan Arts Fete and artists, writers, musicians and actors performed in the winding streets of the medieval town, below the 10th century Tour Barberousse (Redbeard’s Tower). I saw a number of authors, who, like myself only two weeks before at Clapham Village Fete, were talking to visitors and selling their books. All were regaled by a number of local bands (see left). Gruissan is today far more than a medieval town with salt pans attached, having been developed, from the 1960s onwards, into a holiday resort and marina. The yachts are very impressive. But we were there for a different purpose, to eat at La Cambuse de Saunier. 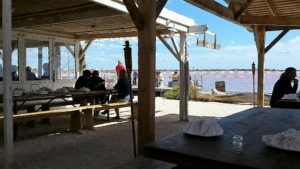 There is no booking at this restaurant, which is mostly outdoors, on the sandy beach which forms one side of the salt flats. Diners eat at wooden benches, and, though most tables have shelter from the sun, there is little from the wind. Nonetheless, it is always full and often has to turn custom away. The reason is its famous salt baked dishes, of bass or bream, so fresh it almost wriggles, pork or chicken, completely coated in Gruissan salt and baked in the oven. This being the south of France it also has a wide choice of shell fish, including Gruissan oysters, though not cooked in salt. 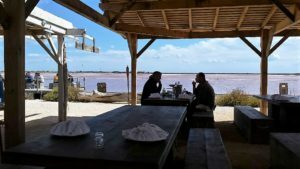 From the tables one looks over the salt pans, sometimes blue in colour and sometimes pink, the pink hue caused by algae in the water. As clouds obscure the sun the water changes from one colour to another as the light moves, giving a curiously surreal tint to the scene. Although these photos may suggest otherwise (we got there early) the restaurant was full and buzzing and the fish was excellent, though not cheap. Tours around the salt pans are available from the office (see the web-site at Salin de L’Ile St Martin ). This entry was posted in From a Foreign Field, History and tagged Foreign field, History by juliej. Bookmark the permalink.